Home › Articles › Why a Brazilian Solution Provider is a good choice for a vendor in a time of crisis! Everything we read, everything we hear is that everywhere, the main focus is short term. The current economic crisis has spread like fire on dry grass around the world, and with that, the medium to long term thinking and planning has taken second seat to the immediateness of urgent action. Companies are struggling to make the basic ends meet, like payroll, and as a result, we have seen massive layoffs, which in turn, put additional pressure on the companies themselves, as a result of less consumption of goods and services. The problem is probably even greater that everyone figures it out to be, since no one really knows when the bottom will be reached, and when a turnaround seems to be likely. What is a fact, however, is that, urgent measures need to be taken, and that an experienced mindset is needed, to determine which action items have the better chance for an immediate positive impact. Every report that is available today in the market, mentions that most companies are only looking for immediate cost-cutting solutions, and that it is imperative that the results are shown in the same fiscal year. The Everest Research Institute and Gartner, both, have released recent studies, that showcase the need for the focus on the issues that have immediate impact, so companies may survive the current crisis. There is no sense in thinking about medium long term, if you are not sure you will still be around. In other words, now it is time for the short term thinking combined with innovative ways of doing things. This calls for a special kind of breed. It calls for a breed that has experienced having to sell his or her lunch to be able to eat supper. It calls for a breed that saw his or her money burn in their pockets at a rate faster that they could blink. It calls for a breed that understands that the future is right this next minute, and is able to negotiate the cab ride on the way in, because on the way out, it would already be more expensive. It calls for a breed that has the immediateness mind set embedded in its cultural DNA. This is why, when companies seek IT services providers and partners, they must check out Brazil. Brazilian businessmen and professionals have a PhD. In handling crisis and developing short term strategies which produce immediate results. Especially in the areas that matter most, the pocket and the bank. 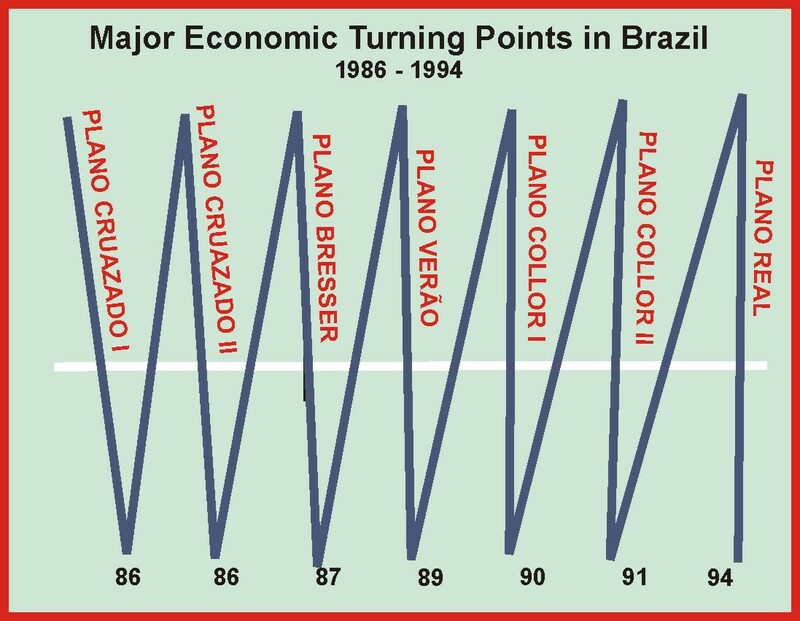 See the graph below, which illustrates the 7 major economic plans that the Brazilians lived from 1986 through 1994. Graph 1 – Illustration of the 7 major economic plans implemented in a 8 years span in Brazil, and that changed the economic rules and people’s immediate outlook every time. Brazil lived through several years of high inflationary environments coupled with many unorthodox economic plans, (a total of 7 in 8 years), that made the rules of the market change almost on a daily basis. Brazilians would wake up every morning not knowing to which direction they should run in order to make ends meet. Because of this, they have developed an expertise of how you parachute and land running. It has become part of the cultural DNA to deal with constant changing economic environments under crisis. Being able to react in fast and adequate fashion to a constant changing environment is imperative for survival in the current times. “In a crisis situation, there are so many urgent matters, that there is little difference between short and long term goals. The future is now right this next minute. When we face a crisis, historical experience show us that, the immediate actions should be the basis for a long-term strategy”- Michael Porter, March 2009. According to a recent conversation with the Gartner analyst Frances Karamouzis, the capability to provide and implement an immediate solution that can be integrated into a medium-long term strategy, will be a key differentiator. Explaining the well crisis-tuned Brazilian DNA, and how it translates into a value proposition focused in time to market and leveraging opportunity costs, she agreed that the Brazilian offer brings a very important and much needed vision to the table. The ability to act fast, as most of the customers that have recently contacted her, indicated that they are implementing solutions that are able to address their short term needs, in less than three weeks. So, when looking for the next partner or strategic solution provider, that is going to make the difference in the immediate future and sustainable for the medium long term, don’t forget to check out the Brazilian alternative. You may be positively surprised by finding a solution provider that has actual experience in being creative and effective through constant changing times. Like a Brazilian entrepreneur, I thought several times to move my company to another country in order to have a less complicated business environment to work, to employ and to sell our software development services. Reading your article showed me that in somehow this environment gave me an experience that I was not totally aware. Yes, we got accustomed to the roller coasters. Thanks.